This edition of Modern Restaurant Management (MRM) magazine's Research Roundup features digital trends, drone delivery trends and a super amount of Super Bowl stats. 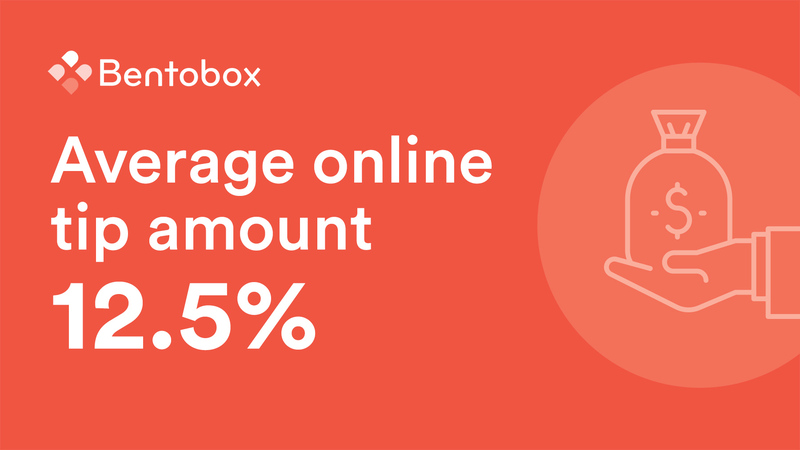 BentoBox released its 2018 Year in Review, a comprehensive look at digital trends in the restaurant industry. The following insights were gathered from over 3,100 restaurants, 59,000 online transactions, 530,000 menu items, and 210 million restaurant website visits. 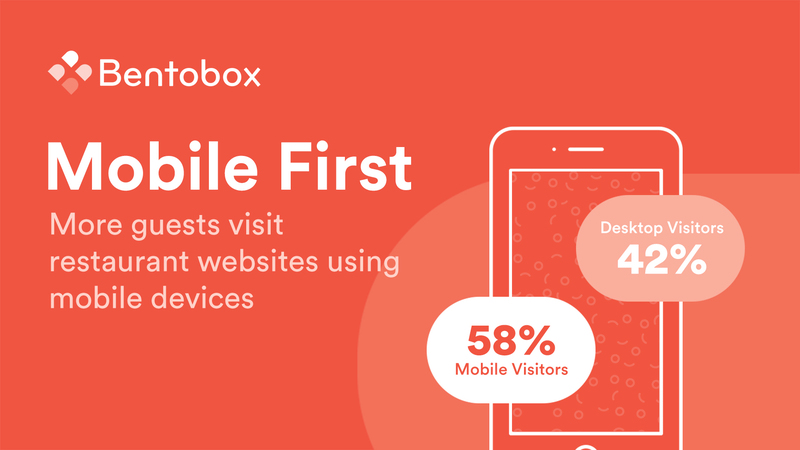 Read more about BentoBox’s 2018 trends and data insights here. Motus' 2019 State of Delivery Trend Report revealed that though workers for use of their personal vehicles for business, 82 percent of employers don’t ask workers to track mileage in any way, 39 percent reimburse their delivery workers with a flat amount, 24 percent include the use of employee vehicles and vehicle-related expenses in the employee’s wage and 10 percent reimburse employees for mileage. The report provides examples of major U.S. cities where using a flat amount per delivery can impact delivery workers’ actual wage. For example, when a flat amount is paid per delivery in New York, NY, the high costs of driving in the city significantly decreases the average delivery worker’s take-home wage. 31 percent of employers said that the most important factor when hiring a delivery worker is finding someone with the ability to represent the brand well. 25 percent cited a safe driving record, 22 percent pointed to availability, 10 percent value a driver’s ownership of a vehicle, 8 percent relevant experience and 4 percent cited other factors as the most important to consider when hiring delivery workers. An overwhelming majority of employers use their own employees to deliver their goods and services (79 percent). However, at the same time, many have started to explore the world of using third-party vendors, contractors or gig workers to deliver goods (21 percent). Employers are largely undecided about whether they’d hire on-demand or gig workers to deliver their goods. 28 percent said they would hire gig delivery workers, 38 percent said they would not and 34 percent admitted they were unsure. 86 percent of respondents reimburse or credit customers for incorrect orders or late deliveries. Incorrect orders/late deliveries cost 60 percent of businesses $100 or less each month, but for an unlucky 20 percent, these costs balloon to in between $100 and $500 a month. According to Coherent Market Insights, the global delivery drones market is projected to exhibit an impressive CAGR of 22.3 percent over the forecast period (2018 – 2026). Increasing usage and adoption of drones in e-commerce/ quick service and restaurants/ healthcare supplies, and introduction of hybrid drones for transportation and logistics sector are some major factors driving growth of the delivery drones market. Moreover, increasing delivery drone fleet sizes due to expanding geographical reach by e-commerce service providers such as Amazon, Google, and UPS are expected to aid in growth of the delivery drones market during the forecast period. Complex terrain and limited range of drones are some major factors restraining growth of the market, owing to lack of capability to drop the product at exact locations in dense and low connectivity areas such as rural and mountain areas. The limited range and lesser flight time of delivery drone is expected to be a negative factor, which will impact the delivery drones market during the forecast period. The global delivery drones market is segmented on the basis of drone type, application, component, and region. Among drone type, rotor blade segment held the dominant position in the market in 2017, owing to its high quality of vertical take-off and landing capability, ease of use, and enhanced control and stability to hover in air. Among application, e-commerce segment held the dominant position in the market in 2017, and is expected to retain its position throughout the forecast period. This is owing to high usage of drones in e-commerce industry for delivery of products in rural areas, where transportation vehicle cannot be reached or takes longer time. Furthermore, increasing e-commerce sector is expected to propel growth and adoption of delivery drones in different regions. Moreover, e-commerce companies are focusing on availing approvals for usage of drones for product delivery at different countries by the respective government, wherever restrictions or ban on use of drones is imposed under certain circumstances. For instance, in 2016, Amazon signed a contract with the UK government to test the usage of drones for product delivery in the country and in December 2016, the company delivered its first product (Amazon Fire TV streaming device and a bag of popcorn) with drone in the UK. North America was the dominant region in the global delivery drones market in 2017, and is projected to maintain its dominance during the forecast period, owing to increasing use of delivery drones for commercial as well as military applications (medic supplies) in the region. Moreover, North America is expected to be the second fastest growing region for delivery drones market, owing to increasing production and deliveries of drones in the region for commercial purposes. When it comes to healthy eating New Year’s Resolutions, 2019 is off to a promising start. Data from ezCater, reveals salad orders grew by 10 percent nationally through the year's first three weeks, while pizza orders nosedived by 20 percent, compared to the same period last month. While most restaurant chains saw a slump in customer traffic around the Thanksgiving and Christmas holidays, Gravy Analytics, a location-intelligence platform, found that certain fast food chains fared better during the week of Thanksgiving than Christmas/New Years. 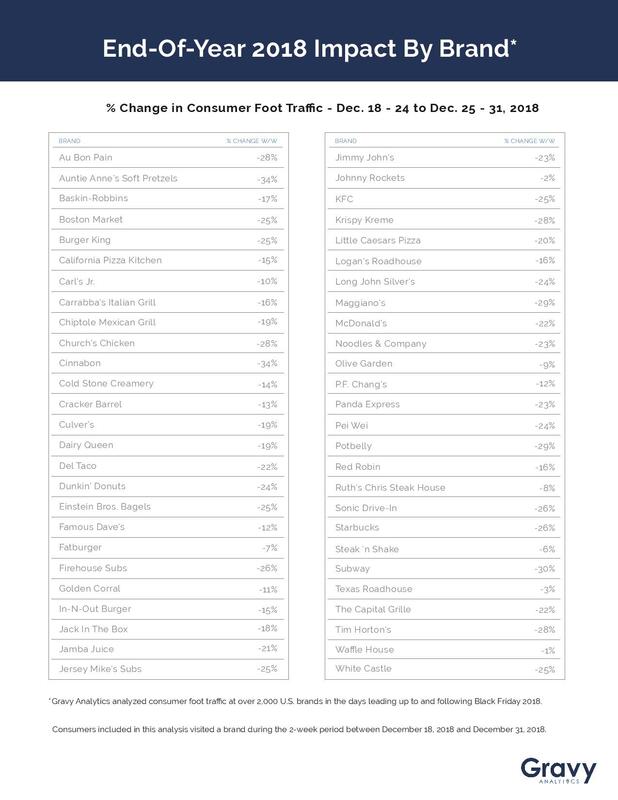 The above findings compare foot traffic at more than 2,000 food chains during the weeks of Nov. 12-19 and Nov. 20-26, 2018 with Dec. 18-24 and Dec. 25-31, 2018. For restaurants, this Sunday isn’t about New England or Los Angeles, it’s about gaining the most yardage at the viewing party table. According to newly released data from Cardlytics, pizza dominated food budgets in the Patriots’ hometown of Boston last year with a 187 percent increase in spend compared to an average week. But for Los Angeles, it was all about the tacos with a 37 percent increase in spend over annual averages. Grocery retailers and local restaurants are making preparations in advance of the big game next week as consumers make their plans. According to Frito-Lay, individual cities have their own snacking preferences – however, one thing is consistent no matter where you live, what you’re buying or who you’re cheering for: consumers like to shop locally. In a survey conducted last year of over 1,000 US consumers, Valassis found that 52 percent are willing to travel less than four miles for their big game purchases and 43 percent will shop locally. Given your interest in restaurant trends, would you be interested in scheduling a conversation with Curtis Tingle, chief marketing officer at Valassis to discuss how small businesses have an opportunity to sell big next week? 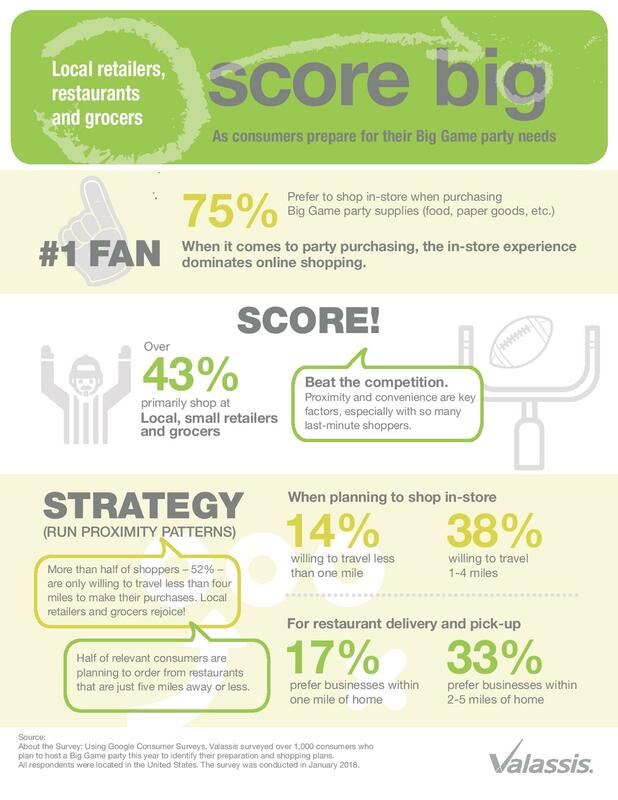 Curtis can discuss how small businesses can be wiser this year when prepping for the big game. I’ve included additional takeaways from the survey below for consideration. Department stores are the most popular Valentine’s Day shopping destination, visited by 35 percent of shoppers, followed by discount stores (32 percent), online (27 percent), specialty stores (18 percent), florists (16 percent), small or local businesses (14 percent), jewelry stores and specialty clothing stores (each 9 percent). The complete results for January, including interactive charts detailing all data at a national, regional, state, metro, and industry level, are available here. Brands in the UK should ensure their vegan food products remain healthy to consumers, says GlobalData. As veganism becomes increasingly available in mainstream retail, consumers’ attention inevitably shifts towards how healthy a vegan product is. Brands should address this by reducing sugar and salt levels in processed vegan food, removing allergens and adding ingredients beneficial for the vegan diet, says GlobalData, a leading data and analytics company. GlobalData’s 2018 Q3 survey found that three percent of consumers in the UK were describing their daily diet as vegan, a moderate figure, but still bigger than the global two percent. Thirty percent of social media users interact on social media at least 10 times per day by either liking, sharing, or posting content, according to a new survey from The Manifest, a business news and how-to website. Nearly 70 percent of users post images, compared to 47 percent who post updates/announcements, 46 percent who post videos, and 42 percent who post opinions. Although interacting with other people’s content is important to most social media users, nearly all (94 percent) post their own content, including 42 percent who do so at least once a day. Social media lets people interact beyond their immediate surroundings. More than half (52 percent) of people use Facebook the most often among social media platforms, more than three times the number of people who most often use YouTube (16 percent) and Instagram (14 percent). he global culinary tourism market is expected to post a CAGR of over 9 percent during the period 2019-2023, according to the latest market research report by Technavio. Increase in integrative culinary and cultural events introduced at music and arts festivals offer opportunities to food service providers and other culinary tourism suppliers to get access to the large customer bases. The introduction of food trucks is a critical factor that will boost market growth. These food trucks provide customers with a broad and trendy selection of local flavors. Destination management organizations (DMOs) are also taking note of the growth of different art and festival events, and the role of food in them. Many destinations worldwide have started collaborating with local businesses and celebrated native chefs to promote activities that focus on different types of culinary offerings. As per Technavio, the growing popularity of sustainable and organic culinary tourism will have a positive impact on the market and contribute to its growth significantly over the forecast period. This global culinary tourism market 2019-2023 research report also analyzes other important trends and market drivers that will affect market growth over 2019-2023. Currently, tourists are interested in the origin of food, drinks, and local products. Moreover, with organic culinary tourism being a niche market, especially among European culinary tourists, several culinary tour operators are enjoying a competitive advantage by offering organic food options to these tourists. Thus, with the growth in organic culinary tourism market in regions such as Europe and North America, sustainable and organic culinary tourism is expected to gain popularity during the forecast period. “Countries such as the US, the UK, Germany, France, China, Australia, and Spain are witnessing an increasing number of travelers, both domestic and international. This is contributing immensely to the growth of the global culinary tourism market. Developing countries, such as Sri Lanka, India, and Mexico, are also upgrading their tourism infrastructure, which is expected to augment the market growth during the forecast period,” says a senior analyst at Technavio. This market research report segments the global culinary tourism market by type (domestic and international) and geographical regions (Europe, North America, APAC, South America, MEA). The European region led the market in 2018, followed by North America, APAC, South America, and MEA respectively. However, during the forecast period, the APAC region is expected to register the highest incremental growth due to the growing economies of APAC countries. The increase in the number of travel operators, luxury service providers, and a rising number of exotic spots and destinations will also fuel market growth. The report also found that consumers snack food choices aren’t limited strictly to flavor. Emerging attributes for snack food consumers are snacks that encompass uniqueness, and sensory elements such as texture, heat, and aromatics. It seems the traditional three meals a day are facing an evolution in Canada, as new research from Mintel reveals that nearly half (46 percent) of better-for-you (BFY) snackers* feel that it is healthier to snack throughout the day than to eat three large meals. In need of constant fuel, many Canadians have snacks at the ready with two-thirds (65 percent) of BFY snackers believing it’s important to always keep healthy snacks on hand. Keeping up with their interest in snacking throughout the day, more than half (51 percent) of Canadians agree that they’d like to see more healthy snacks packaged for eating on the go. What’s more, it seems there’s potential for anything to be considered a snack among younger consumers, as 45 percent of Canadians aged 18-24 are interested in snack-sized portions of regular foods as compared to 31 percent overall. As consumers look to make better choices for themselves, it seems fresh and less processed snacks are coming out on top as fresh fruit and vegetables (84 percent) are the nation’s top better-for-you snack of choice, followed by cheese (79 percent), nuts (69 percent) and popcorn (60 percent). In fact, Mintel research shows the snack innovation that consumers are most likely to say they would like to see more of is products made from fresh ingredients (55 percent). While fresh snacks are winning out, younger consumers are placing power in protein to keep them full. Three in 10 (30 percent) consumers say they eat meat snacks, with younger snackers aged 18-34 the most likely age group to agree (41 percent). Although just 16 percent of consumers say they are interested in snack bars made with meat, one third (32 percent) of men aged 18-34 are keen to see more of this type of offering. Following the growing flexitarian movement, it seems that plant-based has potential when it comes to better-for-you snacking as three in 10 (29 percent) consumers say they are interested in snacks made with plant-based protein, rising to four in 10 (39 percent) among women aged 18-34. While Canadians are keen to enjoy healthy snacks, there are significant concerns. Nearly three-quarters (73 percent) of BFY snackers believe that many snacks marketed as healthy are not actually healthy, with just 41 percent saying they trust the health claims on food and beverage packaging. And for many, there’s confusion when it comes to making a healthy snack choice, as half (49 percent) say it is hard to tell if a snack is healthy. Allergen food labels are a source of confusion for today’s Brits according to latest research from Mintel, as only 37 percent of consumers agree that it is easy to identify which allergens a product is free from by its label. While pre-packaged goods are legally required to highlight on-pack the presence of any allergens, almost half (48 percent) of Brits are unsure whether or not allergen labels are clear, and a further 15 percent actively disagree that this is the case. Meanwhile, a UK-wide allergen labelling system on free-from product packaging appeals to 29 percent of those who have bought/used free-from products, a figure which rises to 39 percent of those users who avoid foods/ingredients because of an allergy or intolerance. Estimated to be worth £837 million in 2018, the UK free-from market has seen stellar growth over 2013-18 with sales growing by 133 percent over this time period. Emma Clifford, Associate Director of Food and Drink at Mintel, said, “Potential changes to allergen labelling has received a lot of high profile media coverage recently, with speculation that the Government is planning to introduce new changes following the death of Natasha Ednan-Laperouse, who died after suffering an allergic reaction to a Pret baguette. Given the perceived lack of clarity and the dangerous health implications that ambiguous allergen labelling can have on consumers, there is a real need for companies to make the presence of allergens very obvious on labelling. According to Mintel, just under half (48 percent) of consumers say that they, or someone in their household, avoid at least one food/ingredient, with 16-24-year-olds (61 percent) the most likely age group to report household avoidance of foods/ingredients. Overall, there has been no significant change in the share of UK consumers that avoid certain foods or ingredients over the past year. Perhaps surprisingly, only 20 percent of consumers (or other members of their household) avoid certain ingredients due to an allergy or intolerance, which is on a par with those who do so as part of a healthy lifestyle (22 percent). Of those who have eaten/drunk free-from foods, 28 percent do not avoid any foods/ingredients. Meanwhile, three in ten (30 percent) Brits avoid certain foods/ingredients for other reasons (eg ethical, vegetarian) rising to 38 percent of under-25s and 41 percent of females in this age group. While dairy is the most commonly avoided food/ingredient (17 percent), avoidance of dairy has remained unchanged over the last three years. Soya (16 percent), fish or shellfish (16 percent), red meat (15 percent) and lactose (15 percent) make up the top five foods/ingredients which Brits avoid. Gluten-free products remain the nation’s most popular type of free-from food with 27 percent of consumers having purchased or eaten these over six months, despite only 12 percent of consumers reporting that they or somebody else in their household avoid gluten. Meanwhile, a quarter (23 percent) of consumers have purchased dairy substitutes, while 19 percent have bought dairy-free foods. A quarter (26 percent) of consumers say free-from diets are good for digestive health, but 44 percent say that it is hard to know whether they have health benefits for those without an allergy or intolerance. A further 40 percent worry that following a free-from diet puts you at risk of missing out on certain nutrients. “The idea that following a free-from diet could potentially put people at risk of missing out on certain nutrients is a concern for a significant number of consumers. Gluten-free products carrying nutrient fortification claims are not widespread in the UK market, suggesting a missed opportunity. While highlighting the absence of allergens is vital, spotlighting nutritional credentials is also important for free-from products, particularly to appeal to those opting for these products as part of a healthy lifestyle. The artisan and specialty cheese industry is evolving, according to the American Cheese Society’s (ACS) newly released reports from its State of the U.S. Artisan/Specialty Cheese Industry Survey. There are nearly 1,000 artisan and specialty cheesemakers in the U.S., researchers found, a number which has increased significantly over past decades. Seventy-six percent of cheesemakers reported annual cheese production of 50,000 pounds or less, indicating that this growing industry largely consists of smaller businesses. Cheese continues to top U.S. specialty food sales at more than 4 billion dollars in 2017, according to the Specialty Food Association. Yet the artisan and specialty cheese industry is not without challenges – despite overall growth, just 80 percent of cheesemakers operated profitably in 2017, and average profit margins were slim. Ninety-two percent of cheesemakers reported that maintaining profitability is an area of concern. Unsurprisingly, cheesemakers that reported a higher production volume averaged higher gross revenue. However, strong revenue doesn’t necessarily translate to profit. The higher the cheesemaker’s gross revenue, the lower the profit margin on average – evidence that bigger isn’t necessarily better in the artisan and specialty cheese industry. “Cheesemakers put an incredible amount of passion into creating their products, and these in-depth surveys show just how challenging that work can be,” says ACS Executive Director Nora Weiser. The global oyster sauces market is expected to post a CAGR of over four percent during the period 2019-2023, according to the latest market research report by Technavio. The penetration of pre-made meals and online grocery home delivery services have reduced restaurant visits and expenditure at food-service outlets among cost-conscious consumers. Furthermore, with ready-made recipes available, oyster sauce is a critical ingredient in many fast food dishes. Cooking shows are also encouraging people to experiment and cook at home. Moreover, increasing awareness of healthy eating habits, is leading to the growing preference and propensity for home cooking, which will increase the demand for oyster sauce during the forecast period. As per Technavio, the increasing innovations in packaging will have a positive impact on the market and contribute to its growth significantly over the forecast period. This global oyster sauces market 2019-2023 research report also analyzes other important trends and market drivers that will affect market growth over 2019-2023. Packaging plays a crucial role in the sale of oyster sauce as it helps retain the flavor, taste, quality, and texture. Packaging is a brand extension of the product and is a crucial factor that influences the purchase decision of consumers. Therefore, several major companies are collaborating with packaging manufacturers to develop advanced packaging technologies and attract consumers. The shelf life of oyster sauce shelf life depends on the ingredients, production methods, and packaging method. Manufacturers are also offering oyster sauce in small, convenient packets. “Apart from the innovations in packaging, the increasing number of product launches, growth in the retail landscape, and increasing oyster production are some major factors that are expected to boost the market during the forecast period,” says a senior analyst at Technavio. This market research report segments the global oyster sauces market by end-user segment (retail and foodservice) and geographical regions (APAC, North America, Europe, South America, and MEA). The APAC region led the market in 2018, followed by North America, Europe, South America, and MEA respectively. However, during the forecast period, the North American region is expected to register the highest incremental growth due to the growing popularity of the Asian cuisine and many Asian vendors expanding their businesses to increase their market share in the region.